Who Works on cars near you? Fast T's fixes it where it fails! Everything we do, we bring to you! on site auto services provider! 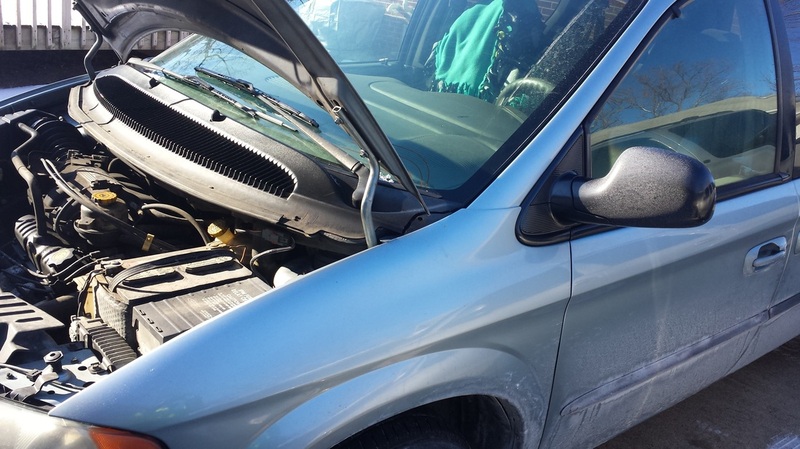 AUTO REPAIR SHOP on Wheels....The Parking Lot, or your driveway, Is our service Garage! "Put Your Mind at Ease" with Fast T's! ​GET YOUR CAR FINE TUNED or fixed up AT YOUR PLACE....WE BRING OUR GARAGE TO YOU, anywhere you are IN WEST DES MOINES, WAUKEE, JOHNSTON, CLIVE, NORWALK, GRIMES, & MORE! Fast T's Mechanicians will troubleshoot, fix, and mend your engine failure, or faulty motor components on your time! Harness the affordability of Mobile Battery Jumpstart And Replacement Service for you! WE CHANGE YOUR BATTERY in YOUR CAR, and ON LOCATION! Mechanical Diagnostic Testing to Assess and Identify your Faulty Engine component, ABS Indicator or Fault Code, Drive Train Light Diagnostics, Transmission Diagnostics, Four Wheel Drive Diagnostics, Bad Sensors, or Broken or Worn Parts on your car; Providing the Right Fix with Quality Auto Parts, Masterful Engine Repairs, and both Computerized & Mechanical Diagnostics On Site wherever you are! ​Fast T's Mobile Automotive Battery Services does! ​Automotive Tire Services are Also Available! ​Tire Service will respond with Urgency to your Flat Tire, Damaged Tires, or inflation problems. We will Air up & install your spare tire back on your car, & torque the lug nuts with a torque wrench to the Manufacturer Recommended Lug nut Torque Specifications for your Car or Truck Wheel. available in West Des Moines, Iowa. We provide Automotive house calls at your home! Car or Truck where you are! come to your location to correct your automobile problems! Search for Automotive repair Shops, your Auto Parts, Tires, new Batteries for your vehicle, & MORE with Fast T's Custom Googlemotive Search motor below! 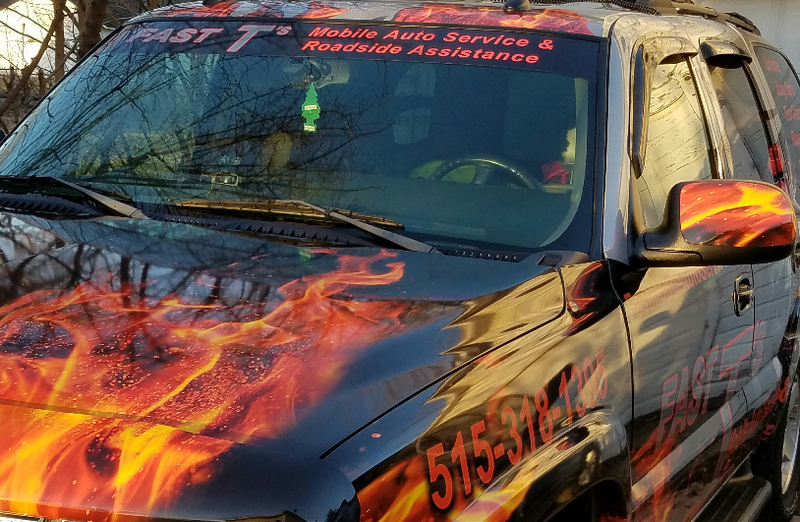 ​Automotive Repair of West Des Moines, Iowa is your local auto and truck mobile car & light truck Repair Leader. Your engine break down problem is solved, with Fast T's Motor Mechanic Troubleshooting, and Repairing. Our Seasoned Masterful Technicians will mend your motoring failure, with New, Remanufactured, Rebuilt, or Refurbished automobile parts. ​You can avoid the tow truck altogether; Allowing you to invest your money in reconditioning your car or light truck, instead of paying a tow truck and towing it into a shop! 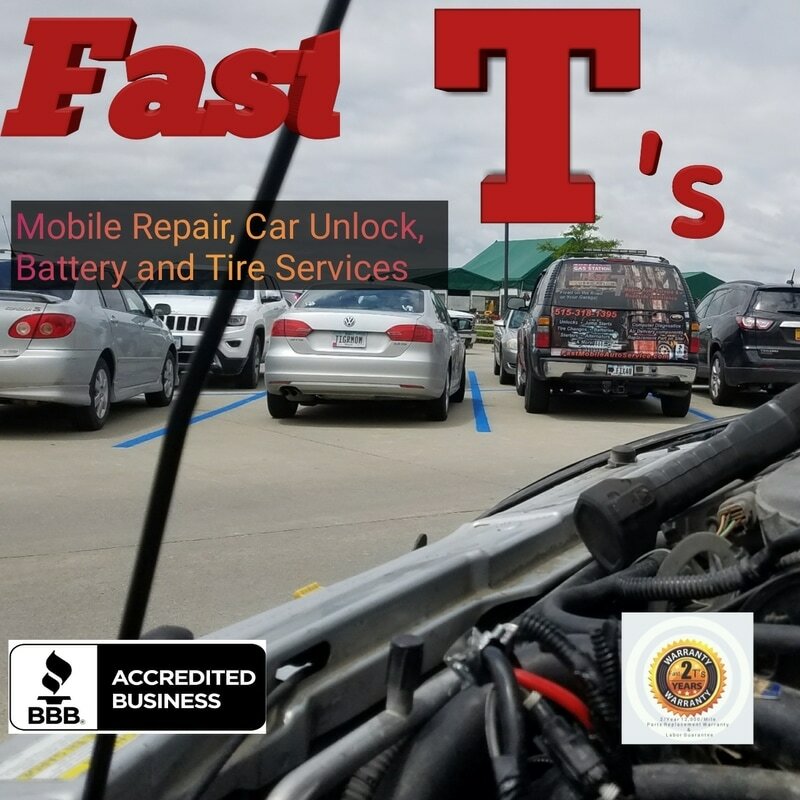 With over 20 years of professional experience as a Motor Mechanic Repairman, a Roadside Assistance Provider, & a Towman; Fast T's is able to quickly respond, Diagnose your engine problem, and implement a professional solution or fix, to your engines malfunction or failure. We have a large auto parts supply network, enabling us to locate most automotive parts, and provide installation of your new, or used auto parts by a well qualified Mechanic, with same-day Auto Services in most, but not all situations. Your Fast T's experienced Mechanical Repairmen are always ready to tend to, troubleshoot and mend, your automobiles operating problems. Motor Mending possible depending on availability, and the circumstances. Listed here are only a few of the automobile fixing and maintenance services we offer. Please call us with any questions, we are available 7am-5:30pm daily to help you get your car started, & back in operational condition! 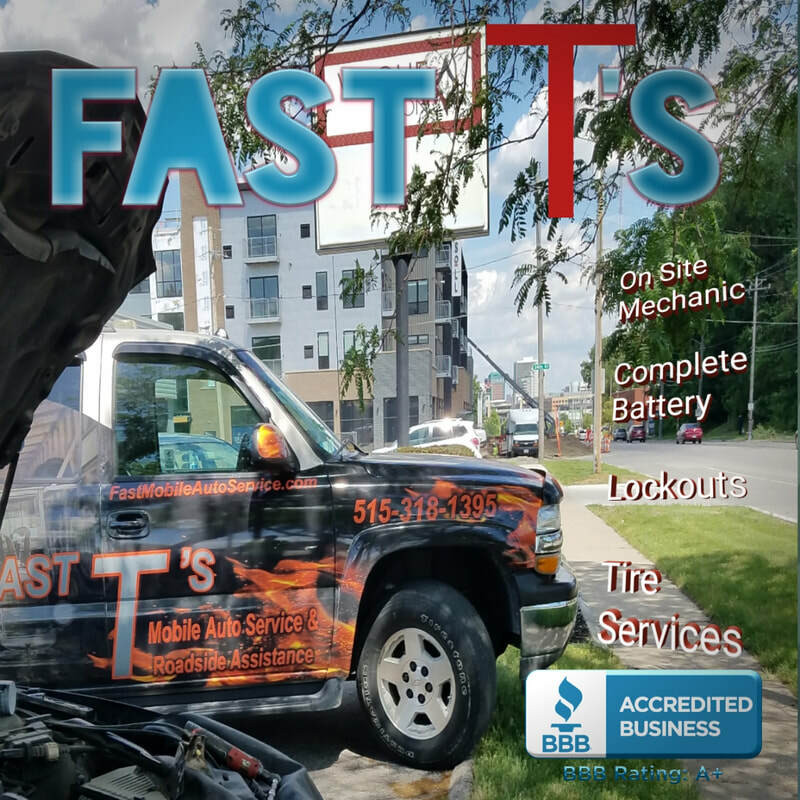 At Fast T's Mobile Auto Service of West Des Moines, IA (Open 7am-5:30pm) We pride ourselves in performance with High Quality Mobile Mechanic Services, Automobile Tires and Batteries, Unlock Services, & Roadside Services, at an affordable price. Thanks To The Overwhelming Support Of Our Prided Customers, We Are continuing to see tremendous success, exponential growth, & great exposure. We Thank all of our valued customers, and friends, for your continuing support and, for placing your Trust in Us! ​We have recently been Awarded the Best Small Business of the Year Award in West Des Moines, Iowa for 2015-2016. We believe that a great customer service experience always begins and ends with a Smile. We pride ourselves In providing an expedited response to your Automotive Roadside Emergency at an affordable price. See the Press Release of our Award below. ​Thank You For Trusting Fast T's To Put Your Mind At Ease! You can Always "Put Your Mind At Ease" with Fast T's Mobile Auto Service, Car Repair, & Lockout of Iowa. We proudly provide On Site Car Servicing in West Des Moines, Iowa, and ALL surrounding communities in the Des Moines Metro area, and Central Iowa. ​Engine Troubleshooting/Repairs, Tire Change, Tire Repair, Tire Replacement, Air Delivery, Automobile Maintenance, Auto Parts Pick Up / Installation, Full Service Automotive Referal, Do it Yourself Help, & MUCH MORE! "Put your mind at Ease with Fast T's"
Gaurunteed customer service satisfaction Always! "Put Your Mind at Ease" with Fast T's Mobile Motor Repairing, and Diagnostics. We will Travel to you to Fix Your Vehicle properly, and Have You Back On The Road In No Time, At An Affordable Price! We are proud to be your Automotive Motor Diagnostic & Mobile Engine Mechanic leader of Central Iowa! ​ "Put Your Mind at Ease!"